Based on previous DIGIWHIST research, we use a unique database of the EU-wide Tenders Electronic Daily (TED) which describes public procurement activities across the whole EU-28 between 2006-2015, through more than 4 million records. Each dimension of good governance as well as a composite score are calculated and their validity tested by comparing them to widely used regional indicators such as GDP/capita, European Quality of Government Index (EQI), or public service meritocracy. All tests confirm that the indicators proposed, based on prior academic and policy literature, are valid. specific public procurement as well as broader developmental objectives. Corruption (e.g. the use of non-open, opaque procedure types). 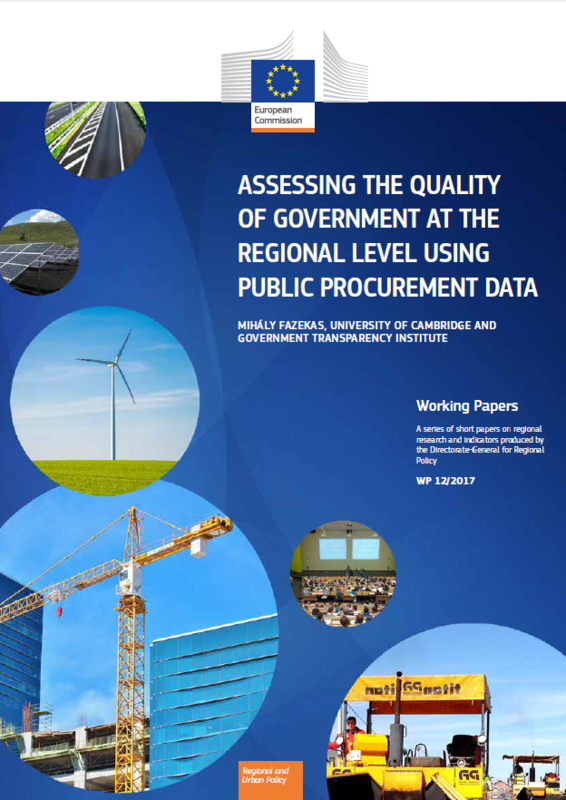 The new indicators enable a detailed analysis of the quality of NUTS 3 and NUTS 2 regional public procurement governance according to the four above-mentioned dimensions, while changes over the last 10 years can also be explored. We find a mixed picture of regional convergence between 2006-2015 in the EU. While some Central and Eastern European regions have converged to the EU average, many Mediterranean regions have strongly diverged and, surprisingly, some well-governed Western and Northern European regions have also experienced a strong deterioration in governance quality. Overall, governance quality and competition in particular have deteriorated across the whole EU. Increase competition in public procurement by encouraging market entry of both local and non-local firms; for example, through: a) better use of e-procurement and especially the complete implementation of various electronic tools, such as e-submission, e-invoicing, or e-contract monitoring; b) a more extensive use of central purchasing bodies as well as framework agreements for homogenous, standard goods; c) improving auction and tender design by better accommodating bidder characteristics, such as the needs of SMEs; and d) reducing bureaucratic controls on public procurement processes combined with better monitoring of outcomes or incentives for administrators better aligned with public goals (e.g. pay for performance). Understand the broader political and institutional antecedents of governance decay and design tailored solutions; for example, through: a) increasing pay for civil servants and political office holders and improving meritocracy in the public service; b) improving political competition; and c) better regulating political finance, campaign contributions, and personal connections between bidding firms and political office holders. 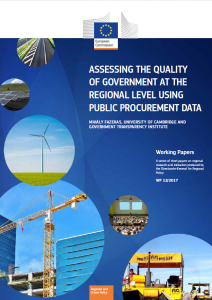 Understand better the contribution of procurement governance quality to the effectiveness of EU funds and regional convergence to boost critical functions. a) improving data scope and quality via better legislation as well as investment in IT systems; b) combining TED data with national public procurement datasets in cases where the latter are of sufficient scope and quality; and c) encouraging the regular use of public procurement analytics in EU and national policy implementation and design (e.g. Tableau).